War of the Gargantuas seems to exist in this magic zone; it’s not a well-known film or at least not one discussed by the public very often, but for a lot of people, it was the first film that really turned them into giant monster movie fans. It was a staple of Saturday afternoon and late night movie showing on broadcast television. As such I elected to review the American edit, since that was the same version that I saw when I was ten on a rainy Saturday morning. Things begin with a boat crossing the ocean late at night. A lone man is piloting and he's so into it he fails to see the huge tentacles slipping in through the windows to grab him. A giant octopus appears, whom you may or may not remember depending on which cut of Frankenstein Conquers the World (1965) you’ve seen. After a brief struggle the octopus withdraws, not out of mercy, but because a huge green monster is trying to tear it apart. The octopus quickly escapes and the green monster decides to smash up the boat itself, even going so far as to swim after the unlucky pilot. The guy washes up on the shore along with the clothes of his shipmates and begins babbling about “Gargantuas.” Dr. Paul Stewart (Russ Tamblyn), Dr. Yuzo Majida (Kenji Sahara) and Akemi (Kumi Mizuno), experts on giant monsters, are called in to help investigate. It turns out that they once had a baby Gargantua in captivity but it escaped. Soon the green Gargantua is coming up on the shore to chow down on people and spit out the clothes. But is it the same Gargantua? War of the Gargantuas is a fun monster film; it’s easy to see why a lot of people take to it when they see it as kids. It’s fairly fast moving, the monsters are big and colorful. There is a certain childish glee when the Green Gargantua is grabbing people to snack on. Much like Frankenstein Conquers the World, the more human monster costumes allow for some dynamic fights between Green Gargantua and Brown Gargantua. There’s some great destruction on display, my personal favorite being the Green Gargantua picking up tanks and throwing them through houses. At the same time there a bit more depth to the monsters as well, the Brown Gargantua feels the need to protect its green brother from the army but at the same time doesn’t want the Green Gargantua to kill any more humans. The humans involved on the other hand are pretty one note characters. Dr. Stewart is totally cynical about everything that’s happening and never progressing much beyond that state. Akemi isn't given much to do but fret and get put in peril. Yuzo definitely takes a back seat to the proceedings, probably because this was the American edit. Since most people are there to watch the monsters this all pretty forgivable. War of the Gargantuas has a lot to offer, it’s colorful and camp but at the same time there is a bit of tragedy and plenty of action. 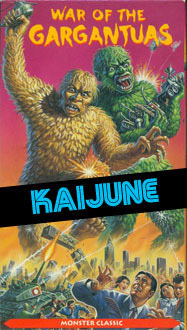 Its a great kaiju film and just a great film in general. This is fine, fine kaiju! I recently saw Aadi Yug, a Bollywood caveman movie - and they used the whole fights between Frankensteins monster and Baragon from Frankenstein Conquers the world in it. I will rewatch both of them soon I think. Thanks for a fine review.